Use reusable packaging for storage that can be used for multiple purposes. Buy reusable items. For example, buy bottles instead of cans, rechargeable batteries instead of normal batteries. 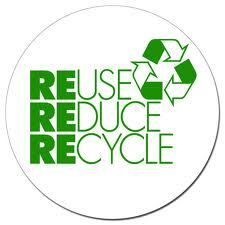 Do not throw away items that you no longer need but can be reused by others. For example, clothes, furniture, children games, TVs etc. If you don’t need them give them to friends or for charity. Unsubscribe to all mailing lists and shop catalogues in order to reduce the paper waste. Instead prefer electronic mailing lists and online catalogues. In US around 35% of the solid waste is paper, packaging and paperboards. It corresponds to 10.000 sheets per person. Prefer buying bulk items in a single reusable package instead of individually wrapped items in a disposable package. At the supermarket use reusable cotton bags instead of plastic bags. In the case that you do have plastic bags, do not throw them away but reuse them as much as possible (eg in the bins). Recycle all possible items. Prefer buying recyclable products. Set up your way of life in order to facilitate recycling. Find out about the recycling programs around your community. Use mugs and glasses instead of plastic cups. Use composting in order to reduce organic waste (yard waste, food waste). Prefer products that have high quality, long life and are easily repairable. This will significantly reduce the need to dispose the products. Use appliances with a plug rather than appliances with batteries. They have better performance, longer life and no batteries to dispose. If you need to use batteries prefer rechargeable ones. Reduce toxic waste. When buying paints or other hazardous materials buy only the quantity you need and no more. Share any leftovers with friends. Some people consider the above tips as time consuming or even inapplicable. However, once you make a habit of them and you embed them in your way of life it will be very easy to follow. Before buying anything ask yourself how easily the item and its package will be disposed. Always remember the 3R rule. Reuse – Reduce – Recycle.